Silicon is a desirable material for lithium battery anodes because it offers extremely desirable material properties. Silicon has a low discharge potential and a high theoretical charge capacity ten times higher than that of typical graphite anodes currently used in industry. Nanowires could improve these properties by increasing the amount of available surface area in contact with the electrolyte, thereby increasing the anode’s power density and allowing for faster charging and higher current delivery. However, the use of silicon anodes in batteries has been limited by the volume expansion during lithiation. Silicon swells by 400% as it intercalates lithium during charging, resulting in degradation of the material. This volume expansion occurs anisotropically, caused by crack propagation immediately following a moving lithiation front. These cracks result in pulverization and substantial capacity loss noticeable within the first few cycles. Research done at Stanford University indicates that silicon nanowires (SiNWs) grown directly on the current collector (via VLS growth methods) are able to circumvent the negative effects associated with volume expansion. This geometry lends itself to several advantages. First, the nanowire diameter allows for improved accommodation of volume changes during lithiation without fracture. Second, each nanowire is attached to the current collector such that each can contribute to the overall capacity. Third, the nanowires are direct pathways for charge transport; in particle-based electrodes, charges are forced to navigate interparticle contact areas (a less efficient process). Silicon Nanowires have a theoretical capacity of roughly 4,200 mAh g^-1, which is larger than the capacity of other forms of silicon. This value indicates a significant improvement over graphite, which has a theoretical capacity of 372 mAh g^-1. Additional research has involved depositing a carbon coating onto the silicon nanowires, which helps stabilize the material such that a stable solid electrolyte interphase (SEI) forms. An SEI is an inevitable byproduct of the electrochemistry that occurs in the battery; its formation contributes to decreased capacity in the battery since it is an electrically insulating phase (despite being ionically conductive). It can also dissolve and reform over multiple battery cycles. Hence, a stable SEI is preferable in order to prevent continued capacity loss as the battery is used. When carbon is coated onto silicon nanowires, capacity retention has been observed at 89% of the initial capacity after 200 cycles. This capacity retention is on par with that of graphitic anodes today. One design uses a stainless steel anode covered in Silicon Nanowires. Silicon stores ten times more lithium than graphite, offering increased energy density. The large surface area increases the anode's power density, allowing for fast charging and high current delivery. 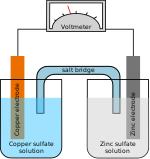 The anode was invented at Stanford University in 2007. In September 2010, researchers demonstrated 250 charge cycles maintaining above 80 percent of initial storage capacity. However, some studies pointed out that Si nanowire anodes shows significant fade in energy capacity with more charge cycles caused by the volumetric expansion of Si nanowires during lithiation process. Researchers has proposed many solutions to remedy this problem: published results in 2012 showed doping impurities to the nanowire anode improves the battery performance, and it is shown that phosphorus doped Si nanowires achieved better performance compared with boron and undoped nanowire electrode; researchers also demonstrated the possibility of sustaining an 85% of initial capacity after cycling over 6,000 times by replacing nominally undoped silicon anode into a doubled-walled silicon nanotube with silicon oxide ion-permeating layer as coating. The silicon nanowire-based battery cell also provides opportunity for dimensional flexible energy source, which would also leads to the development of wearable technological device. Scientist from Rice University showed this possibility by depositing porous copper nanoshells around the silicon nanowire within a polymer matrix. This lithium-polymer silicon nanowire battery (LIOPSIL) has a sufficient operational full cell voltage of 3.4V and is mechanically flexible and scalable. Commercialization was originally expected to occur in 2012, but was later deferred to 2014. A related company, Amprius, shipped a related device with silicon and other materials in 2013. Canonical announced on July 22, 2013, that its Ubuntu Edge smartphone would contain a silicon-anode lithium-ion battery. An anode using germanium nanowire was claimed to have the ability to increase the energy density and cycle durability of lithium-ion batteries. Like silicon, germanium has a high theoretical capacity (1600 mAh g-1), expands during charging, and disintegrates after a small number of cycles. However, germanium is 400 times more effective at intercalating lithium than silicon, making it an attractive anode material. The anodes claimed to retain capacities of 900 mAh/g after 1100 cycles, even at discharge rates of 20–100C. This performance was attributed to a restructuring of the nanowires that occurs within the first 100 cycles to form a mechanically robust, continuously porous network. Once formed, the restructured anode loses only 0.01% of capacity per cycle thereafter. The material forms a stable structure after these initial cycles that is capable of withstanding pulverization. In 2014, researchers at Missouri University of Science and Technology developed a simple way to produce nanowires of germanium from an aqueous solution. Transition metal oxides (TMO), such as Cr2O3, Fe2O3, MnO2, Co3O4 and PbO2, have many advantages as anode materials over conventional cell materials for lithium-ion battery (LIB) and other battery systems. Some of them possess high theoretical energy capacity, and are naturally abundant, non-toxic and also environmental friendly. As the concept of the nanostructred battery electrode has been introduced, experimentalists start to look into the possibility of TMO-based nanowires as electrode materials. Some recent investigations into this concept are discussed in the following subsection. Lead-acid battery is the oldest type of rechargeable battery cell. Even though the raw material (PbO2) for the cell production is fairly accessible and cheap, lead-acid battery cells have relatively small specific energy. The paste thickening effect (volumetric expansion effect) during the operation cycle also blocks the effective flow of the electrolyte. These problems limited the potential of the cell to accomplish some energy-intensive tasks. In 2014, experimentalist successfully obtained PbO2 nanowire through simple template electrodeposition. The performance of this nanowire as anode for lead-acid battery has also been evaluated. Due to largely increased surface area, this cell was able to deliver an almost constant capacity of about 190 mAh g−1 even after 1,000 cycles. This result showed this nanostructured PbO2 as a fairly promising substitute for the normal lead-acid anode. MnO2 has always been a good candidate for electrode materials due to its high energy capacity, non-toxicity and cost effectiveness. However, lithium-ion insertion into the crystal matrix during charging/discharging cycle would cause significant volumetric expansion. To counteract this effect during operation cycle, scientists recently proposed the idea of producing a Li-enriched MnO2 nanowire with a nominal stoichiometry of Li2MnO3 as anode materials for LIB. This new proposed anode materials enable the battery cell to reach an energy capacity of 1279 mAh g−1 at current density of 500 mA even after 500 cycles. This performance is much higher than that of pure MnO2 anode or MnO2 nanowire anode cells. Heterojunction of different transition metal oxides would sometimes provide the potential of a more well-rounded performance of LIBs. In 2013, researchers successfully synthesized a branched Co3O4/Fe2O3 nanowire heterostructure using hydrothermal method. This heterojunction can be used as an alternative anode for the LIB cell. At operation, Co3O4 promotes a more efficient ionic transport, while Fe2O3 enhances the theoretical capacity of the cell by increasing the surface area. A high reversible capacity of 980 mAh g−1 was reported. The possibility of fabrication heterogeneous ZnCo2O4/NiO nanowire arrays anode has also been explored in some studies. However, the efficiency of this material as anode is still to be evaluated. In 2016 researchers at the University of California, Irvine announced the invention of a nanowire material capable of over 200,000 charge cycles without any breakage of the nanowires. The technology could lead to batteries that never need to be replaced in most applications. The gold nanowires are strengthened by a manganese dioxide shell encased in an Plexiglas-like gel electrolyte. The combination is reliable and resistant to failure. After cycling a test electrode about 200,000 times, no loss of capacity or power, nor fracturing of any nanowires occurred. ^ Liu, X. H.; Zheng, H.; Zhong, L.; Huang, S.; Karki, K.; Zhang, L. Q.; Liu, Y.; Kushima, A.; Liang, W. T.; Wang, J. W.; Cho, J. H.; Epstein, E.; Dayeh, S. A.; Picraux, S. T.; Zhu, T.; Li, J.; Sullivan, J. P.; Cumings, J.; Wang, C.; Mao, S. X.; Ye, Z. Z.; Zhang, S.; Huang, J. Y. (2011). "Anisotropic Swelling and Fracture of Silicon Nanowires during Lithiation". Nano Letters. 11 (8): 3312–3318. doi:10.1021/nl201684d. PMID 21707052. ^ Chan, C. K.; Peng, H.; Liu, G.; McIlwrath, K.; Zhang, X. F.; Huggins, R. A.; Cui, Y. (2007). "High-performance lithium battery anodes using silicon nanowires". Nature Nanotechnology. 3 (1): 31–35. doi:10.1038/nnano.2007.411. PMID 18654447. ^ Verma, P.; Maire, P.; Novák, P. (2010). "A review of the features and analyses of the solid electrolyte interphase in Li-ion batteries". Electrochimica Acta. 55 (22): 6332–6341. doi:10.1016/j.electacta.2010.05.072. ^ Park, M. H.; Kim, M. G.; Joo, J.; Kim, K.; Kim, J.; Ahn, S.; Cui, Y.; Cho, J. (2009). "Silicon Nanotube Battery Anodes". Nano Letters. 9 (11): 3844–3847. doi:10.1021/nl902058c. PMID 19746961. ^ Garthwaite, Josie (September 15, 2010). "Amprius: Building a Better Battery, from the Anode Up". Gigaom.com. Retrieved 2011-09-26. ^ Chakrapani, Vidhya (2012). "Silicon nanowire anode: improved battery life with capacity-limited cycling". Journal of Power Sources. 205: 433–438. doi:10.1016/j.jpowsour.2012.01.061. ^ Kohandehghan, Alireza (2014). "Nanometer-scale Sn coatings improve the performance of silicon nanowire LIB anodes". Journal of Materials Chemistry A. 2 (29): 11261–11279. doi:10.1039/c4ta00993b. ^ Vlad, Alexandru; Reddy, Arava Leela Mohana; Ajayan, Anakha; Singh, Neelam; Gohy, Jean-François; Melinte, Sorin; Ajayan, PulickelM (2012). "Roll up nanowire battery from silicon chips". Proceedings of the National Academy of Sciences. 109 (38): 15168–15173. doi:10.1073/pnas.1208638109. PMC 3458382. PMID 22949696. ^ Lyle (December 21, 2007). "Interview with Dr. Cui, Inventor of Silicon Nanowire Lithium-ion Battery Breakthrough". GM-Volt.com. Retrieved 2011-09-26. ^ a b Newman, Jared (2013-05-23). "Amprius Begins Shipping a Better Smartphone Battery | TIME.com". Time. Techland.time.com. Retrieved 2013-06-04. ^ "Ubuntu Edge". indiegogo.com. July 22, 2013. Retrieved 2013-07-22. ^ Mon, 02/10/2014 - 1:09pm (2014-02-10). "Researchers make breakthrough in battery technology". Rdmag.com. Retrieved 2014-04-27. ^ Chan, C. K.; Zhang, X. F.; Cui, Y. (2008). "High Capacity Li Ion Battery Anodes Using Ge Nanowires". Nano Letters. 8 (1): 307–309. doi:10.1021/nl0727157. PMID 18095738. ^ Kennedy, T.; Mullane, E.; Geaney, H.; Osiak, M.; o’Dwyer, C.; Ryan, K. M. (2014). "High-Performance Germanium Nanowire-Based Lithium-Ion Battery Anodes Extending over 1000 Cycles Through in Situ Formation of a Continuous Porous Network". Nano Letters. 14 (2): 716–23. doi:10.1021/nl403979s. PMID 24417719. ^ Nam, Ki Tae; Kim, Dong-Wan; Yoo, Pil J; Chiang, Chung-Yi; Meethong, Nonglak; Hammond, Paula T; Chiang, Yet-Ming; Belcher, Angela M (2006). "Virus-enabled synthesis and assembly of nanowires for lithium ion battery electrodes". Science. 312 (5775): 885–888. CiteSeerX 10.1.1.395.4344. doi:10.1126/science.1122716. PMID 16601154. ^ Reddy, MV; Yu, Ting; Sow, Chorng-Haur; Shen, Ze Xiang; Lim, Chwee Teck; Subba Rao, GV; Chowdari, BVR (2007). "α-Fe2O3 Nanoflakes as an Anode Material for Li-Ion Batteries". Advanced Functional Materials. 17 (15): 2792–2799. doi:10.1002/adfm.200601186. ^ Dupont, Loic; Laruelle, Stephane; Grugeon, Sylvie; Dickinson, C; Zhou, W; Tarascon, J-M (2008). "Mesoporous Cr2O3 as negative electrode in lithium batteries: TEM study of the texture effect on the polymeric layer formation". Journal of Power Sources. 175: 502–509. doi:10.1016/j.jpowsour.2007.09.084. ^ Pavlov, Detchko (2011). Lead-acid batteries: science and technology: science and technology. Elsevier. ^ Moncada, Alessandra; Piazza, Salvatore; Sunseri, Carmelo; Inguanta, Rosalinda (2015). "Recent improvements in PbO2 nanowire electrodes for lead-acid battery". Journal of Power Sources. 275: 181–188. doi:10.1016/j.jpowsour.2014.10.189. ^ Moncada, A; Mistretta, M.C; Randazzo, S; Piazza, S; Sunseri, C; Inguanta, R (2014). "High-performance of PbO2 nanowire electrodes for lead-acid battery". Journal of Power Sources. 256: 72–79. doi:10.1016/j.jpowsour.2014.01.050. ^ Wu, Xiaomin; Li, Huan; Fei, Hailong; Zheng, Cheng; Wei, Mingdeng (2014). "Facile synthesis of Li2MnO3 nanowires for lithium-ion battery cathodes". New Journal of Chemistry. 38 (2): 584–587. doi:10.1039/c3nj00997a. ^ Wu, Hao; Xu, Ming; Wang, Yongcheng; Zheng, Gengfeng (2013). "Branched Co3O4/Fe2O3 nanowires as high capacity lithium-ion battery anodes". Nano Research. 6 (3): 167–173. doi:10.1007/s12274-013-0292-z. ^ Sun, Zhipeng; Ai, Wei; Liu, Jilei; Qi, Xiaoying; Wang, Yanlong; Zhu, Jianhui; Zhang, Hua; Yu, Ting (2014). "Facile fabrication of hierarchical ZnCo2O4/NiO core/shell nanowire arrays with improved lithium-ion battery performance". Nanoscale. 6 (12): 6563–6568. doi:10.1039/c4nr00533c. PMID 24796419. ^ "Chemists create battery technology with off-the-charts charging capacity". phys.org. Retrieved 23 April 2016. "Stanford's nanowire battery holds 10 times the charge of existing ones". Stanford News Service. 2007-12-18. Archived from the original on 2008-02-01. "Nanowire battery can hold 10 times the charge of existing lithium-ion battery". Stanford News Service. 2007-12-18. "Nanowire battery holds 10 times the charge of existing ones". Physorg.com. 2007-12-18. Chan, CK; Peng, H; Liu, G; McIlwrath, K; Zhang, XF; Huggins, RA; Cui, Y (2007-12-16). "High-performance lithium battery anodes using silicon nanowires". Nature Nanotechnology. 3: 31–5. doi:10.1038/nnano.2007.411. PMID 18654447. "A Short Introduction to Lithium-Ion Batteries". Amprius. 2009-12-11. Archived from the original on 2009-12-21. Graphene-Silicon Anodes for Li-ion Batteries Go Commercial. XGS presents new silicon-graphene anode materials for lithium-ion batteries. This page was last edited on 16 April 2019, at 16:04 (UTC).